DK or light DK yarn in coat colour, main colour, eye patch colour + small amounts of black for embroidering face features. A 2.5 mm crochet hook. 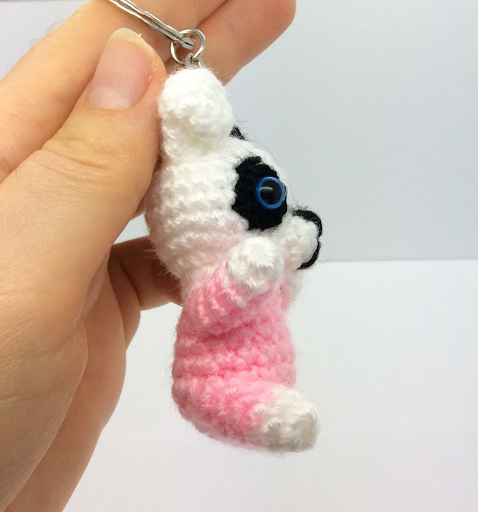 The size of the hook is important, as anything bigger than 2.5 mm might result in an animal that is too large for a keyring. A yarn needle for sewing the different parts together. An embroidery needle for embroidering face features. A stitch marker for working in the round (I use a bit of contrasting yarn, but you can also use especially designed plastic ones). Sc 6 in magic ring. Insert one safety eye through the center of the eye patch. Insert safety eyes between R14 and R15 (2 rounds below the current one), ~ 5 sts apart. Stuff body and head. Add extra stuffing as you go. 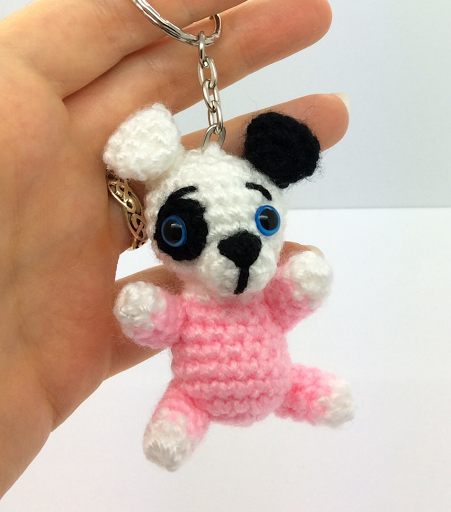 FO leaving long tail for sewing to the keyring. Stuff with the loose ends of yarn. Sew back legs in a seating position. Sew front legs either stretched forward or hanging down. With main colour or a lighter colour such as cream or white. (make 2: one with main colour, one with eye patch colour). Sew eye patch in place. Sew muzzle and ears to head. Fold the ears towards the front and sew them in this folded position. Embroider face features (see photos for guidance).